New Balance's marketing pitch: Our most luxuriously cushioned ride. Upper: Mesh, welded and synthetic leather overlays. 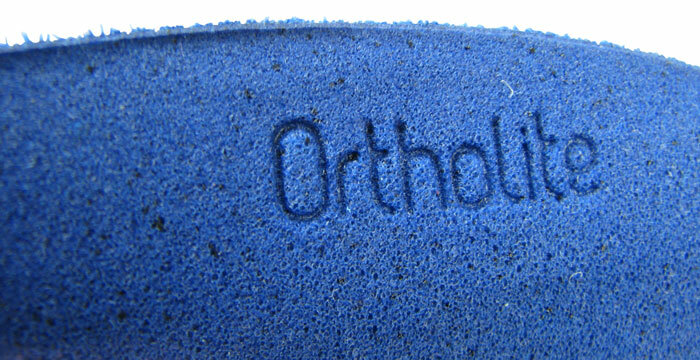 Outsole: Hard carbon rubber in lateral heel, softer blown rubber in medial heel and forefoot. Widths available: B-narrow, D-standard (reviewed), 2E-wide, 4E-extra wide. A neutral shoe sure to find favors with runners seeking a soft heel strike, but the rest of the shoe isn't as plush as it should be. Lacing tends to cinch too narrow, leaving long lace-ends. Collar fit a bit sloppy, zero reflectivity, transitions could be better. If the Boracay and Zante are anything to go by, New Balance is doing a rethink on their system of numeric labelling. It’ll be fun to see how New Balance’s footwear line shapes up going forward, both in areas of product segmentation and naming convention. The Fresh Foam 980 showed up out of the blue last year, when most of the New Balance line was made up of numerically suffixed staples. The 980 was one of the rare NB (probably the only one at the time) shoes to prefix a proper name to its number, setting the stage for the Fresh Foam Zante – another model based on the new platform. The Zante and Boracay (980 replacement) also did away with numbers, and perhaps for the better. For a shoe geek, a numerical label can be an unlovely way to call out a shoe model, a bit clinical and sterile. We, for example, like names which evoke marketable imagery and metaphors. Like the Speedform Gemini. or Asics Gel Nimbus. And who can forget Nike Pegasus, the mythical winged horse? adidas still needs work on the craft of naming. Verbose names like the adidas Supernova Sequence 7 Boost are quite a mouthful, and could do with some text trimming. The reduction on box ink alone could reverse climate change, and fix the hole in our Ozone layer. While the Zante and Boracay could possibly be an indication of New Balance’s decisive shift in nomenclature on the Fresh Foam models, the regular line of numbered staples exist in perfect harmony. Road shoes which follow the conventional classification of neutral and motion control, and for NB loyalists the number has long been the key to understanding a particular shoe’s place in the assortment. The Zante and Boracay are minorities; most of New Balance models still come boxed with a cryptic numbering system. The 1080 is positioned as New Balance’s top neutral cushioned shoe. If you’re looking for New Balance’s neutral and motion control staples north of $100, the numbers 1260, 860, 1080, 890 merits your attention. The 1260 and 860 are motion control models with 1260 at the highest level, followed by a pared down 860. A similar tiering exists on the neutral side, where the 1080 is meant to be the plushest neutral in New Balance’s line, complemented by the lower priced 890 (and 880 too). Given that the Fresh Foam line has already evolved – the foam used in the Zante is now softer compared to the original 980 – there might be a future overlap with New Balance regulars. But for now, the models are sufficiently differentiated, be it construction and ride experience. Every brand has their top neutral shoe. Asics has their Nimbus, the Triumph ISO for Saucony, adidas’ Ultra Boost and Nike’s Vomero. The 1080 V5 fills in that slot for New Balance. The brand calls the shoe their ‘most luxuriously cushioned ride’, with the accompanying material literature calling out the soft footstrike. And as if to appeal to a larger audience, NB highlights the 1080’s stability aspect. Which does not mean thta the 1080 is geared towards motion control; it just implies that there’re elements of support in the shoe which keep the ride unbiased, and hence, neutral. One of 1080’s ‘stability’ elements. 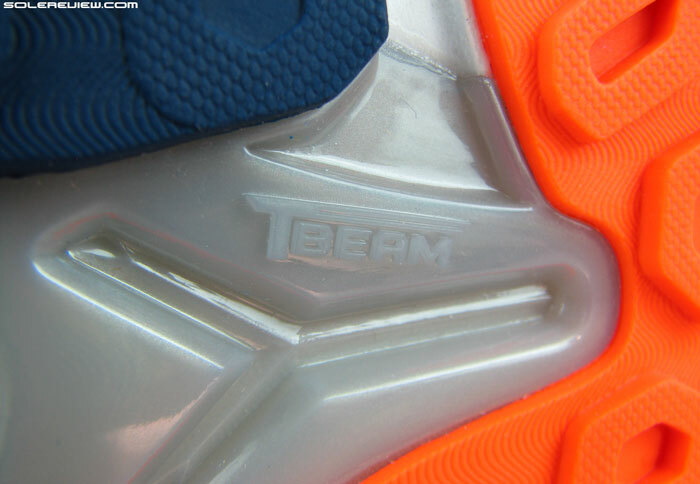 This is the plastic T-Beam shank under midfoot. 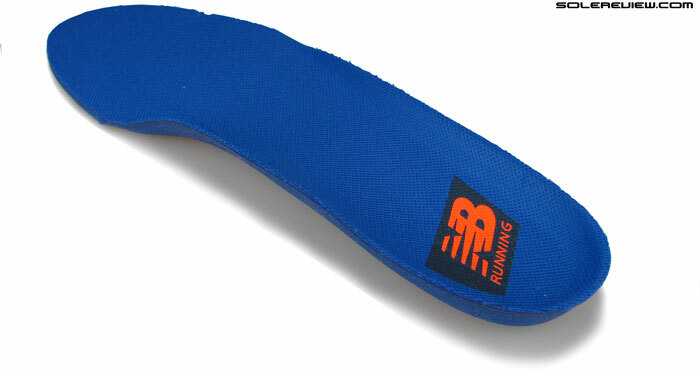 The design goal is to offer a greater level of foot support on the medial (pictured) side. New Balance points out the use of the T-beam plastic shank, which is meant to provide structural midfoot rigidity; and it does. 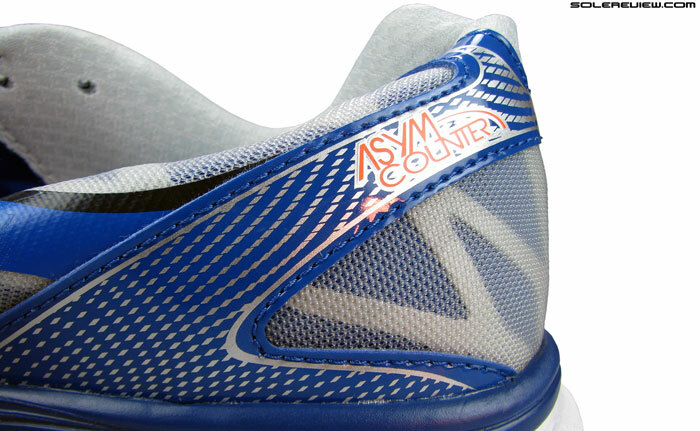 The brand also makes mention of the ‘Asym Counter’, a name for a design feature with asymmetrical lateral and medial heel counter heights. While most shoes come with an internal heel counter which is symmetrical in dimension on either sides, the one used in 1260, 860, and 1080 has a higher medial side compared to the lateral height. The logic being that, the higher medial wall supports the foot when it rolls inwards or pronates, preventing it from going excessively inwards. 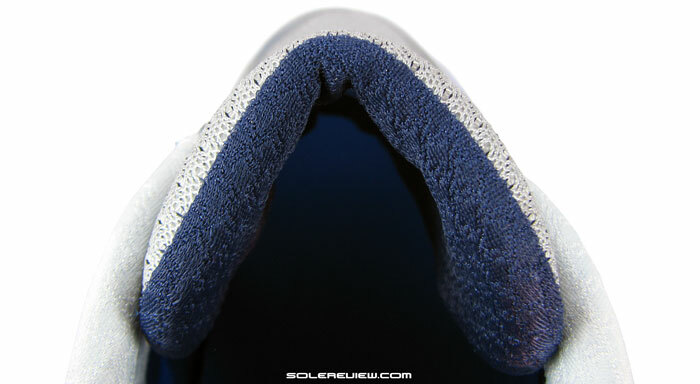 The heel has a soft N2 insert, but rest of the midsole is relatively firm. Midsole wall projects outwards in a pod like shape. This gives the 1080 a supportive, lean free ride quality. We found the midsole wall design to contribute to the supportive feel too. The main midsole might have separate heel and forefoot cushioning inserts doing their thing, yet the midsole packs in a few tricks of its own. 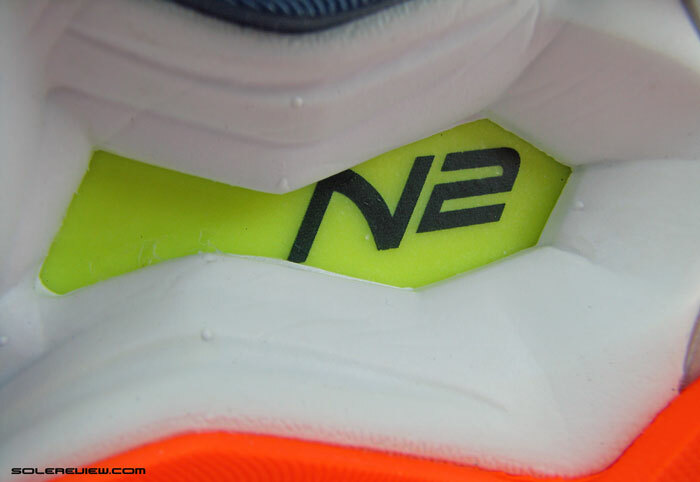 The N2 heel setup might be soft, but the Abzorb midsole casing is firm with pod like projections extending outwards. There are no side grooves or cuts which might make the midsole lean towards either side, so there is a distinct, bias free character to the shoe. We’re sure this is what New Balance means by stability. 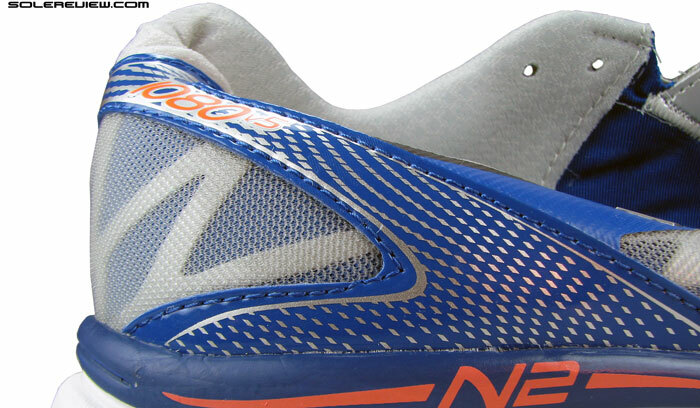 In a cavity below the heel area, a ‘N2’ insert provides a layer of responsive softness. As far as the actual ride is concerned, it lives up to the claims of ‘soft heel strike’ mentioned on the 1080’s product page. The heel has an insert of substantial thickness; when we cut a slit and measured it, we got 8 mm on our scale. 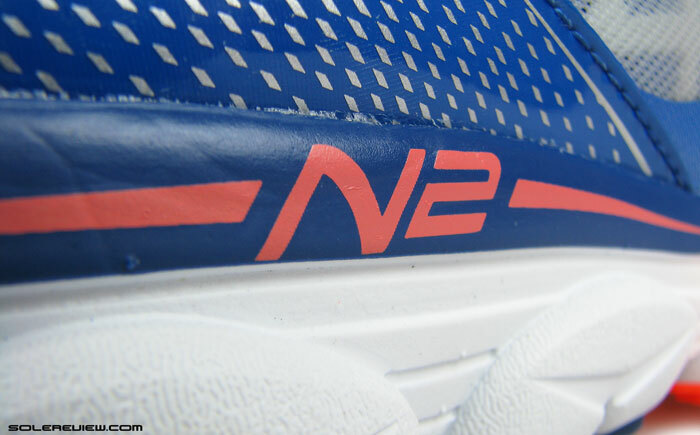 New Balance says that the N2 is ’Nitrogen infused’. Not sure how that works, but we can certainly tell you how it feels. 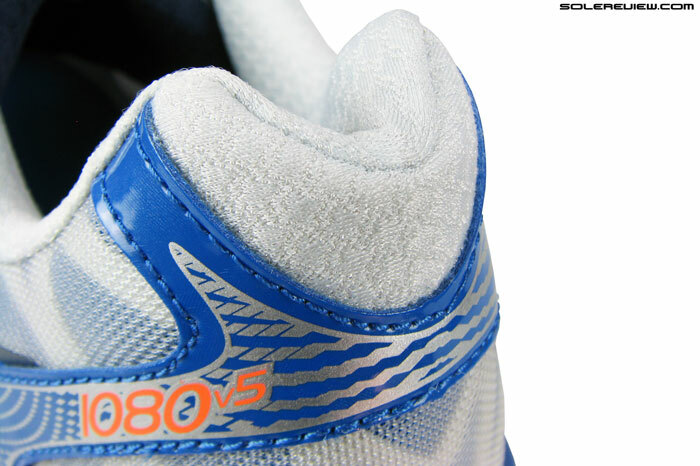 A molded and removable insole is part of 1080’s interior. Open celled foam design, and same as 980 and 1260’s. There is a sink-in, marshmallowy softness on rearfoot strike, with a trace of responsiveness. It is also helped by the removable Ortholite insole over it, a shared part which was used to build the 1260 and Fresh Foam 980 too. 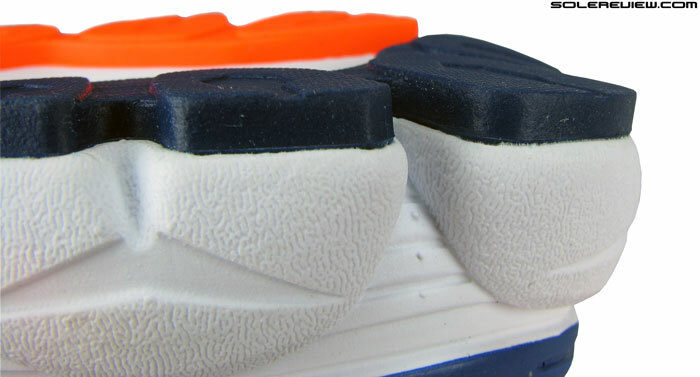 The first layer of cushioning is the open foam footbed which applies a layer of softness from heel to toe. Past that, the N2 insert gets to work, softening heel strikes. Forefoot has a cavity, which houses an additional (lime green) layer of ‘N2 Burst’ material. Heel to toe transition is a bit of work, as the weight attempts to come out of the soft zone and move forward. 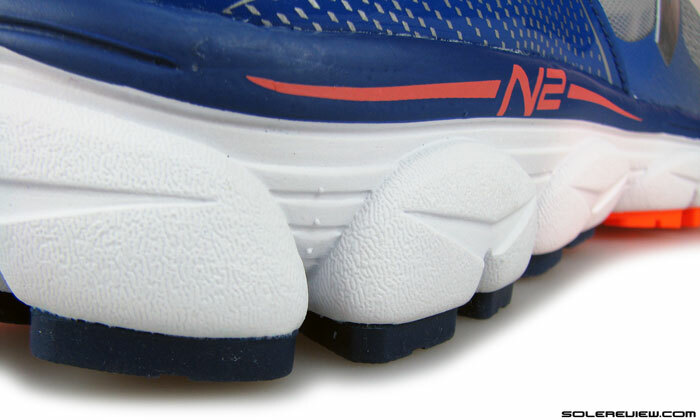 The area under midfoot is firm, and then there’s the forefoot, which uses another version of N2 foam called the ‘N2 Burst’. 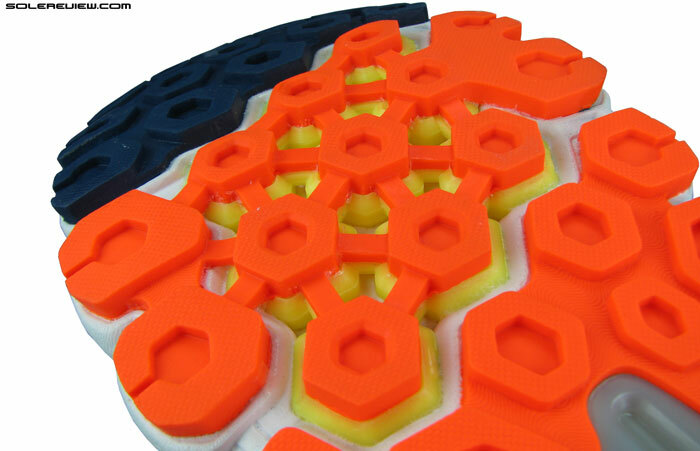 This sits embedded in the forefoot cavity, layered in between the white Abzorb foam and the outsole. The area under the metatarsals or ball of the foot has a network of outsole lugs (to use, they look like cleats) arranged in a branched structure. An analogy would be rubber engine mounts; except that in automobiles the rubber is used to decrease the sensory level of shock and vibration while protecting the engine. 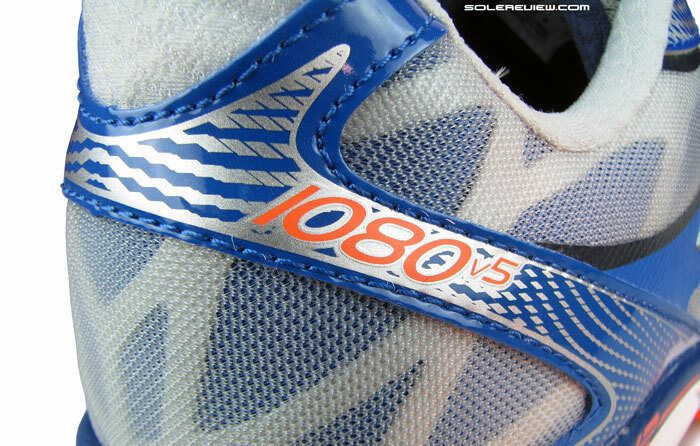 On the 1080, the N2 Burst strives to transmit an elevated sense of cushioning while absorbing shock. The hexagonal outsole pods and N2 Burst is spread out in a branched chain, with each rubber cleat sitting on its own N2 base. 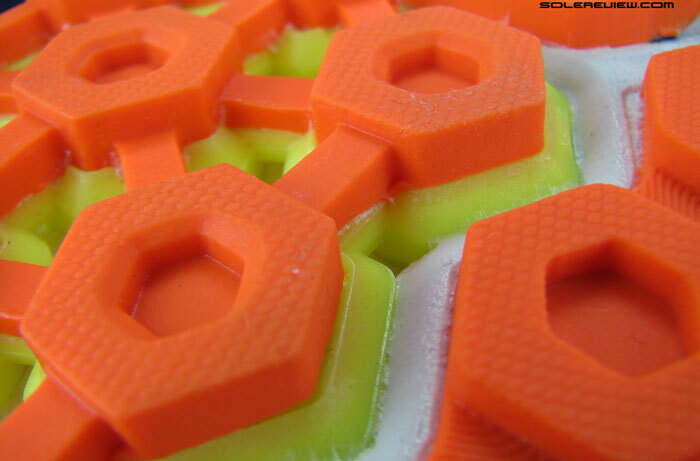 Each hexagonal outsole cleat is seated on its personal ‘N2 Burst’ layer, with the objective of delivering a responsive feel before toe-off, or on forefoot strike. The N2 Burst does work as it should, feeling responsive in that area. It’s not soft like the heel is, and shouldn’t be either. It mixes the right amount of cushioning and responsiveness, and we’re left thinking that this might be a good thing to place under the heel, perhaps on another New Balance model. The 1080 does not pretend to be anything else than a soft footstiker, because that’s exactly what it is. 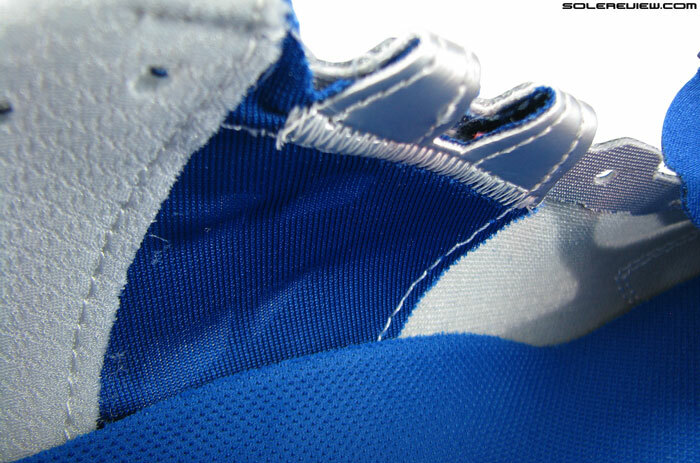 Full contact use of outsole rubber on the 1080. 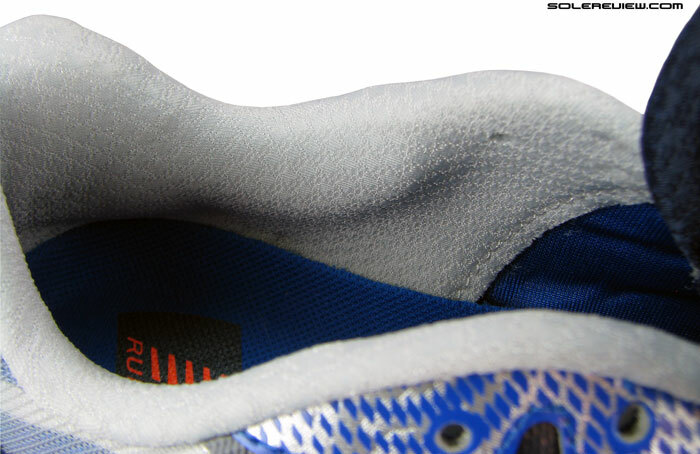 Lateral side has hard carbon rubber, while the rest of the outsole (medial heel included) has softer blown rubber. Heel has a crash pad, but for those who want to know, there’s not much bevel. Like in most New Balance shoes, there’s a generous display of outsole rubber, running full contact heel to toe. 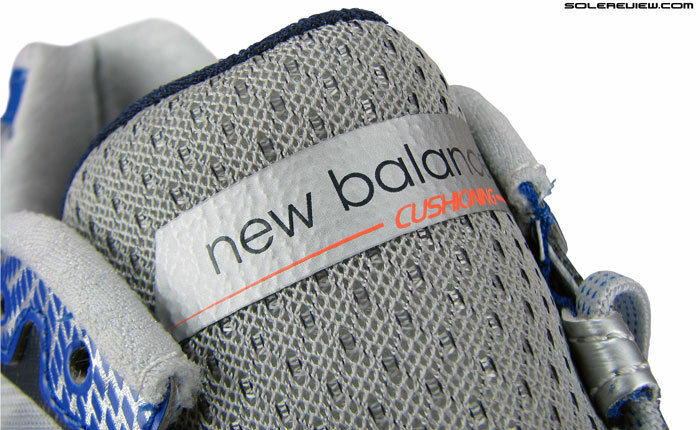 Given the 1080 V5’s targeted demographic of plush ride seekers, the outsole uses mostly blown rubber. Even the heel uses softer blown rubber on the medial side; hard carbon rubber is only used on the lateral heel strike area. The harder heel side also acts as a crash pad, divided from the softer side by a deep groove. The crash pad is beveled, but only slightly so with a minimal curve-up. Because of the soft heel>firm midfoot>responsive forefoot sequence, quick touch and go isn’t the 1080’s strongest suit. Running faster in the shoe tends to be a bit laborious, as the 1080 V5’s selling point becomes a hinderance in effortless transitions. Heel is mushy relative to the rest of midsole, so there is an obvious lack of cushioning consistency along the length of the shoe. At the same, understanding what the 1080 is meant for will help set expectations. Soft heel, firm midfoot and responsive forefoot, layered with the Ortholite squish. The 1080 V5’s solitary goal is to produce a soft ride during runs, and as long as you have that empathy, then the shoe does well, at least in the way the midsole behaves. Coming to think of it, the New Balance 1080 V5 has one of the softest rearfoot strike (feel) amongst other models in this class. Definitely softer than the Saucony Triumph ISO, Asics Nimbus 16, Brooks Glycerin 12 and. The Vomero 9 heel comes close, and the Kayano 21 is soft heeled too. Odd we should bring up the Kayano, because it is a motion control shoe. But true, that. A proper fit for the most part, but is it as plush as it should be? But what the 1080 scores in heel softness, it loses out on upper plushness. The upper while being comfortable and mostly well fitting, certainly feels like it could do better with dialling up on the lux. When measuring sensory plushness, we believe four things to be more important than the rest. The first being a fit which feels comfortable without pressure or seam gremlins. Two, the outer mesh should have an amount of squish and stretch along with material softness. Three, the inner lining should feel smooth and soft to touch, and lastly soft foam padding in tongue and collar areas definitely help in the plushness department. 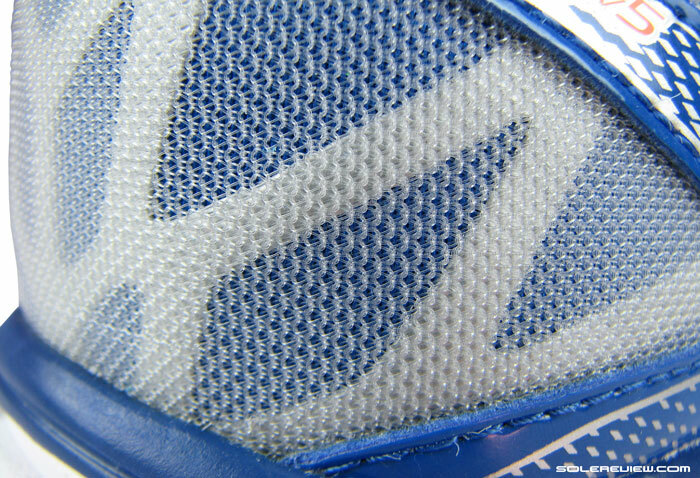 The upper has mostly fused overlays on an unlined mesh. 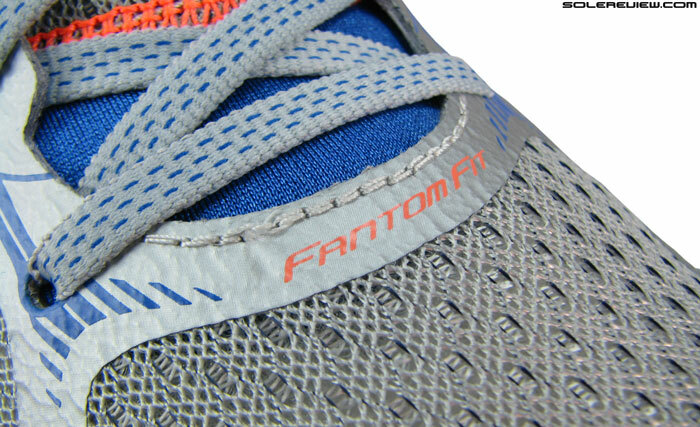 Fantom fit is the name for the seam-free methods used in constructing parts of the upper. No lining inside – at least in the forefoot-so things are ventilated around these parts. 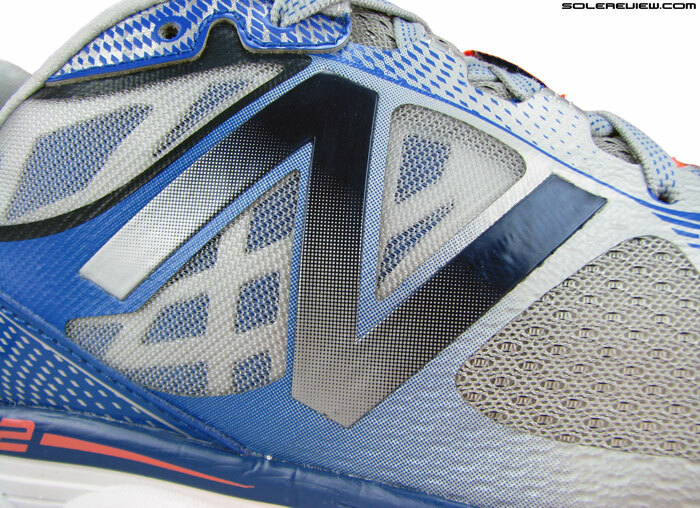 The 1080 V5 does well score on upper fit, as most New Balance shoes do. Like the 1260 V4 and 860 V5, upper combines a network of fused overlays (Fantom fit) with stitched reinforcement in toe and heel areas. 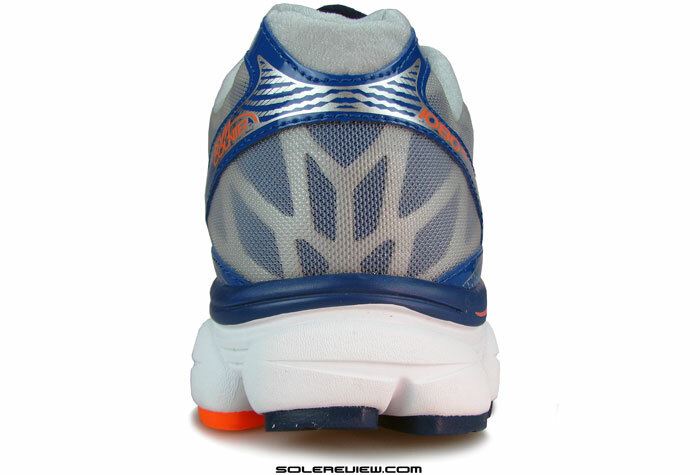 The forefoot fit feels right, snug on the sides but with enough space in the front. Sizing is true, and there’s ample overhead room in the toe box. If you choose to wear the 1080 V5 sans socks, then no issue there too. 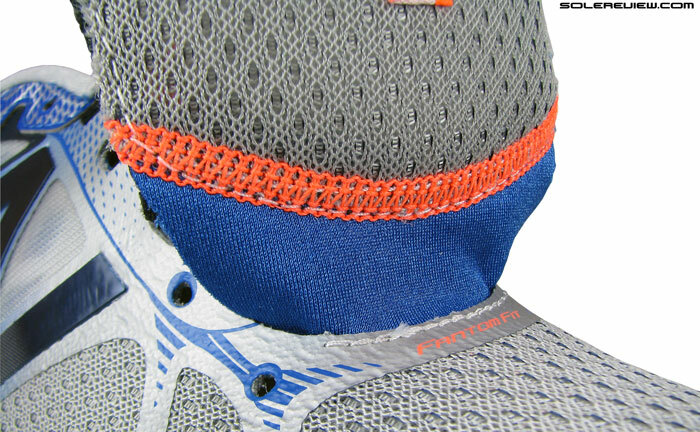 The upper breathes well in the forefoot, a result of unlined mesh. 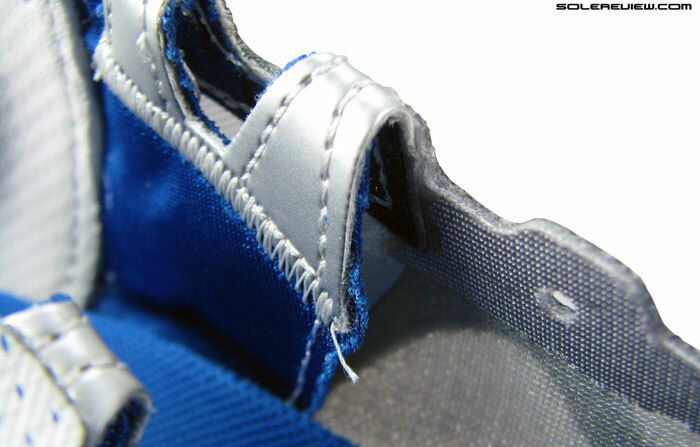 Midfoot has an semi-independent lacing panel for a snugger fit. Two lace loops in the center turn over and form a part of the inner panel. Tug on these, and the fit goes snug. Midfoot does hold well, collar is average. Midfoot fit has a secured sensation of hold around the foot, and that’s because the 1080 uses an inner fit panel. Not seen on either the 1260 or 860, the two center eyelets on the upper form a loop by turning over and connecting to a panel inside. 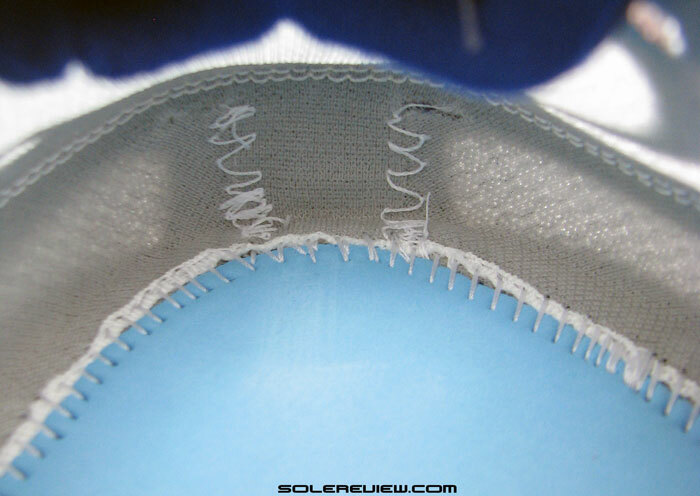 Lacing pressure translates into a tug on these panels, bring the lacing closer. Narrow lacing is good for taking off top down pressure, though there’s a minor side effect. Front of the tongue is elastic, which allows it a range of movement when pulled towards the body. Ungusseted, but the narrow lacing limits movement. There’s more loose lace-ends left over after tightening, and they tend to flap around. Plus side is that if you use the last (sixth) eyelet, it takes care of that issue. It helps that the tongue has an elastic in the front – which means that you can pull on the end so that there’s enough tongue for the last row of lacing to rest on. The collar fit also feels better with the last lacing row utilized, otherwise it comes feeling a bit relaxed. The ungusseted tongue also tends to stay in place, arrested by the narrow lacing holding down its loop. Achilles dip curve is super soft, as the synthetic keeps a wide berth. That was the fit, which for the most part, has no areas of concern. The materials used on the 1080 V5 could have definitely done with an upgrade, given the $150 sticker and 1260V4 as a reference. We don’t have any miles on the new 890 V5, but using the 1260 and 860 as a comparison, the 1080 feels like a shoe with the cheaper 860 V5’s upper slapped on it. Mesh used is on par with a cheaper model like the 860 V5; should have been plusher to match the soft midsole ride. Even the one used on the 1260 V4 will do. Tongue doesn’t have much padding, which takes away the plushness. Collar wall textile could have been plusher too. What’s better than this? The NB 1260, the Kayano 21, Nike Vomero, to name a few. The mesh feels flat and doesn’t have the squish of what was used on the 1260, and there is less padding in both the tongue and collar area. 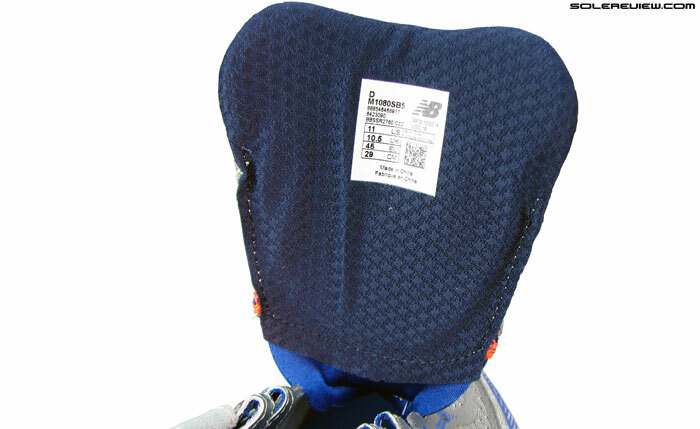 It’s the lining material too; the 1260 V4 had a plusher feeling collar fabric with more foam padding to go. Functionally, does all this make a huge difference, or transform into the 1080 V5 into a better shoe? Heck no. But we have to keep in mind that the shoe does cost $145, and part of that is the pricing promise to deliver a superior sensory experience. You know, cocooning plushness to match the soft ride, that kind of stuff. Brands like Asics and Brooks do pretty well in that area, being able to separate models across price classes by the virtue of suitable material packages. Imagine if the underlay was reflective. Would have been something at night. We also felt that 1080 V5 had a great opportunity to make night time visibility a spectacle. 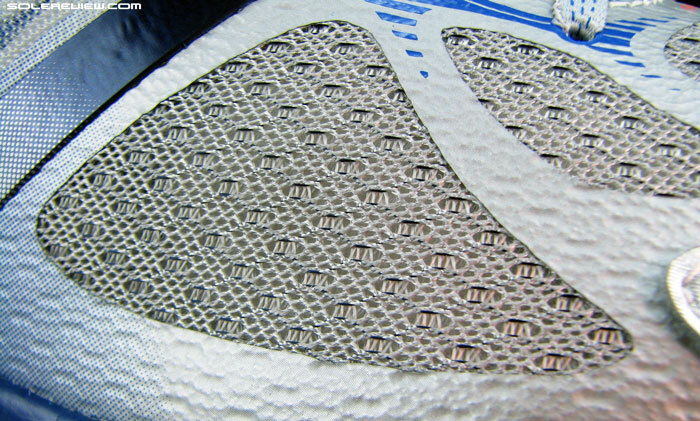 Actually that’s what we thought when we saw the silver latticework underlaid in the heel and midfoot area. That turns out to be plain, silver colored synthetic leather. Actually, there are absolutely no reflective elements on the 1080, which was frankly a surprise. Considering that both the 1260 V4 and 860 V5 have it, and are not substitutes for the 1080. The 1080 V5 had a real chance at picking up the plushness crown, but bungles it with its relatively spartan upper. 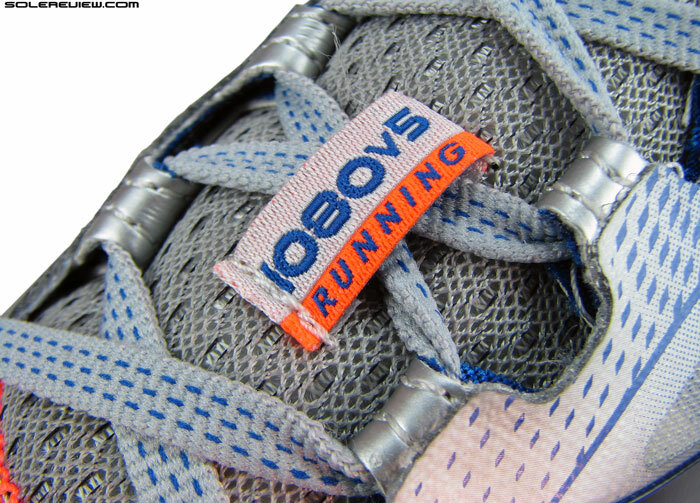 The 1080 V5 does makes good on the soft footstrike deal, and will be a satisfying choice of equipment for runners seeking that kind of cushioning. But you know some shoes that give you this feeling of all pervasive plushness and inclusiveness? Pillow-like cushioning throughout, and an upper which feels sinfully luxurious to slip into? Well, the 1080 is the shoe which should have been that, except it isn’t. There aren’t any deal breakers on the 1080, and it dons the mantle of a soft heel striking shoe rather well. But other than that, the shoe doesn’t evoke a sense of awesome in the context of adjectives which NB uses to market this shoe. Good, but far from great. *sigh* That’s what I was wishing for. Sad to see it didn’t live up to those expectations especially as I think the 1080 is New Balance’s top of the neutral range shoe. Curious to see what you will think of the Fresh Foam Boracay. The 1080 is plush alright, but only in the heel. Rest of the parts are standard fare. No thoughts on the 33 yet, because perhaps the Nimbus 17 will come first. The calendar will change over the next few days. What ever happened to Absorb? Did they drop it for N2…looks almost like Absorb Version 2 or something. They still use the Abzorb in a few models, but expect it to disappear completely, leaving only the Revlite and Fresh Foam EVA variants. Just want to say that I love your reviews. Without contest the best I have managed to find online. I have the v4 of the 1080, think I’m going to pass on this one. I used it mainly for long distance runs (30k) or if my legs where not feeling great. They did an ok job, based on your review I got the Adidas energy boost which is in my opinion a nicer shoe. Although a lot of cushioning it feels a bit more responsive and faster. Btw, after reading the review of Boston boost 5 here I had to get that one as well. Very pleased after the first run, might be the new favorite. Hey, thanks! We keep trying. Nice to know that both the EB2 and BB5 seem to be working out for you. If it interests you, we’ve got the Tempo Boost and Ultra Boost reviewed lined up later this month. Thank you for this very thorough review. I have a pair of 1080 V4 and I really love it. Is the v5 really similar? How does it compare? You’re welcome. But we’re sorry we won’t able to answer your question, as we haven’t tested the 1080 V4. Perhaps someone else can respond to this comment. No problem. Thank you anyway. Your review are awesome. Hey. Love your reviews here. Been looking at the 1080 V5 for a while debating a purchase. Perhaps you can help me out a little. Do you think this would be a good walking shoe? Looking at walking 3 – 5 miles at a time. I like the idea if the soft cushiony heal but you mentioned something about the transition from heal to toe being off (forget your wording). Would this be a struggle to walk in in your oppinion or would this be a good fit? Thank you. Heel to toe transition works different for running than in walking. We think that the 1080 will do just fine for walks. Also fit try the Pegasus 31 too. I’ve been running for a short period and I’m transitioning into adventure sports. I’m yet to find the right pair of shoes for my underpronated feet. The reviews are great but now I’m more confused than when I started. Can you help me? So are you looking for shoes to run in or to do adventure sports in? And what’s your shoe history like – names of past models which worked or didn’t work, etc. Thank you for the feedback. This was our first 1080, so your insight about the V3 is appreciated. I’m running the previous version of this shoe (1080v4). It works well for me as a stabilizing shoe for recovery runs after races, and for very long runs when I want my feet to be held late in the run. I was surprised about what you wrote concerning the uneven transition behaviour, as the smooth transition is what I appreciate most on this shoe. Is it possible that this changed so much from v4 to v5? But then, I realised that you only describe the transition from a heel-striking perspective. As I strike with the mid-foot, the heel does not come much into play for me, although I like the way the shoe makes sure the heel comes down straight. But I only transition from mid-foot to the front, and there the shoe works great for me. Was this intentional on your part? I feel that transition behaviour is an important part of a shoe’s appeal, and probably wouldn’t have bought the shoe based on your review. I realise that you cannot test the shoe running differently than you do normally (makes no sense, really), but you could consider adding a small disclaimer saying that transition may feel different for non-heel strikers. I enjoy your reviews a lot, by the way. They’re not just great information, but also very well written. Keep it up! Thank you for the comment and feedback. Till the time our budget allows us to test multiple pairs of the same model, we will always base our review from a rearfoot striker’s perspective. We have access to US 11 sized forefoot strikers, but then since majority of the runners are rearfoot/heel strikers, a forefoot tester would rob the review of broader relevance. That said, our review methodology is to lay everything bare with detailed photographs, callouts and scorecards, leaving little to second guessing. During the section where we talk about transition, we did specifically mention ‘heel to toe’. I’ve been wearing 1080s for years but was decidedly underwhelmed with the v4 and v5 – sole seems to deflate (not sure how else to describe it) more quickly than before and the upper doesn’t provide enough support. Do you have any recommendations for another shoe that provides the soft ride of the old 1080s with a little more support for a neutral stride? You could give any one of these a fit trial: The Adidas Glide 7 Boost, the Nike Pegasus 32, or the New Balance 890 V5. The reviews are fantastic. Transitioned to the 1080v5 after training for a 25k in Saucony Ride 7. Went to my local NB store to get fitted etc… Was a little skeptical due to price ($155!!) 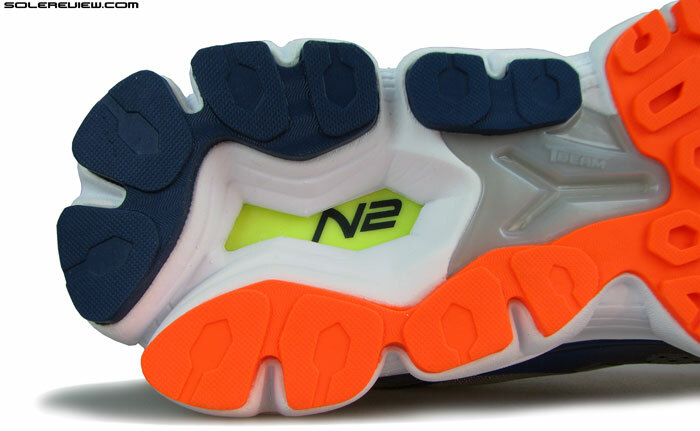 but I have some NB apparel that I really like… Wanted to try their shoes. First run of 6 miles, thought about returning them. Hindsight is 20/20 – now training for a fall marathon and I feel like these shoes are destroying my metatarsals. I am heavy (215 lbs) and a bit of a mid to forefoot striker. Just not the right shoe for me? Bought a pair of hoka one one Clifton 2’s yesterday after hobbling home from an 11 mile steady run on the 1080’s. As the HoKas have not arrived yet, gave the 1080’s their last chance tonight on a 14 miler. Annnd that’s it for them. I feel like the first 2 toes on each foot are broken by mile 9! Very dissatisfied with this shoe. Sorry to hear about the Met heads; otherwise the 1080 V5 should work nicely for forefoot strikers, there’s ample cushioning. That said, the shoe runs a bit narrow in the forefoot, is that the reason why you’re experiencing the issue? How do the Hoka Clifton’s feel so far? Your comment was posted a week ago, so you’d have had the opportunity to take them out for a spin. Curious to know because the Clifton (both v1 and v2) runs narrow in the front as well. A shoe which we recommend for forefoot strikers (and those who like a roomy forefoot) is the Nike Vomero. Plenty of cushioning to go in the front, and abundance of upper space inside. Thanks for the response. The 1080 V5 has plenty of forefoot room for me, coming out of Saucony Ride7 which felt narrow until i had run quite a bit in them. I tried the hoka clifton 2 yesterday and they also have plenty of room. That was my first 6 miles in the cliftons, but i think they are promising. Very lightweight and cushy. Funny thing is that the tongue was supposed to be a great improvement over the clifton 1, and the suckers rubbed me raw on the front of both ankles! Hopefully that goes away after break-in. Thank you for the feedback – if fit is not a factor, not sure what’s causing the met pain. We experienced the tongue blister on the Hoka Vanquish, to the extent that the front edge had to be cut away ( see our Vanquish review). Hoka still has a long way to go in getting their upper act sorted out. i read this and see me in your situation,230lbs and find grate deal for NB1080v5 for 55pounds but D. so,what was yours and how much forefoot room you have in yours? Mine are D width. Never had any problems with room in the forefoot. I’ve been running in these shoes for a little over 3 months, and I have to say, I don’t think I’ll be repurchasing. It’s not terrible, but it’s not worth $140. The only thing I liked about this shoe is the outsole. 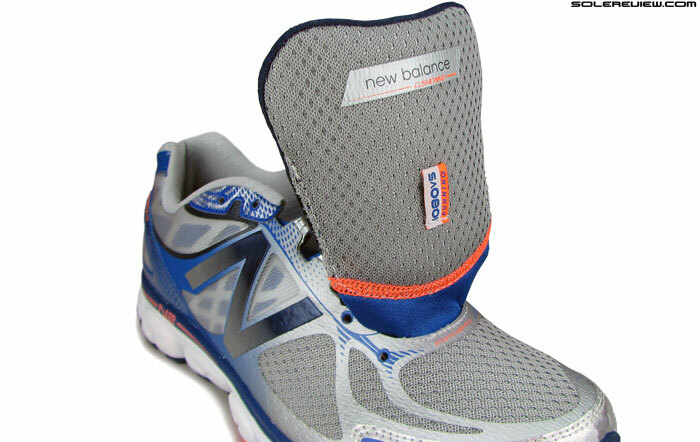 It provides great traction and flexibility unlike the fresh foam models that New Balance currently has. It’s been good enough to take into some tough trails. I’m thinking about getting some trail shoes from HOKA for both trail and road runs as I noticed that the outsole of their road shoes wear out fast. Hi there. Since one year ago I started to training harder for hald marathons with a average of 140 kms per month. The choice was Adidas Boost Sequence 7 . Still, from 3 months ago I started to have severe pain on the left leg when compared to the right one. It seems the effort I put on the left leg was much higher then the one I put on the right leg. Several visits to the physicians I have now the answer. It seems I have a de-compensation that has to be corrected. Despite physiotherapy and a new sockliner special design to compensate the different pronation on each foot, they told me to abandon the Sequence 7 and acquire a neutral shoe with high stability. My training now is for marathon. What models do you suggest ? Neutral shoes with high stability? A few options would be the Brooks Ghost 8, Mizuno Wave Rider 18 (haven’t tried the 19 yet) and Nike Lunarglide 7. Hi, I’m new to this discussion forum but the reviews are excellent. I am looking for some guidance. I have been a dedicated NB runner for years. I was so pleased when they brought back the 1080 a few years ago. I have worked my way up through v2, v3, v4 and then just recently moved into the v5’s which my wife bought me for Christmas. I have got on really well with all the earlier versions. I’m a 195lb, neutral mid foot striker. After a couple of 5-6 mile runs in the v5’s I started experiencing discomfort on the top of the big toe metatarsal on my right foot. I persevered thinking the tongue’s and uppers would break in a little. After 15 runs and 100+ miles I have concluded I will never run in these again. Both feet are now giving me major discomfort in the same area. I noticed the v5’s are now made in China and I’m wondering if the last’s have changed, even though NB assured me they hadn’t. Something is however clearly different. So, where do I go from here? I’m nervous about simply splashing out on the new fresh foam range, even though I’ve read good things about them. I’ve tried Saucony Triumph 9’s in the past which I loved the feel of, but my knees didn’t for some reason I have never explained. Any suggestions would be greatly received. Also, tips on how to heal my bruised metatarsals? Thank you. Does the 1080 V5 feel tight around the forefoot? That at time can lead to discomfort. If you need more room, you could try the Nike Vomero 10. Have no idea on treating your mets – a professional opinion (physio/podiatrist) might be in order. Hi, I’m new too here. I have this NB, like the person below I have used the V3,V4 and V5, but three months ago I bought a pair of Skechers Go Run Ride 4 and I like the feeling while running with them. Right now, I’m looking to replace my NB, but I would like advice since I want something more cushioned than Skechers but less than NB to combine both shoes. Actually I’m running around 45-50 km per week, around 4:25-4:35 min/km, one of the rides is up to 20 km. 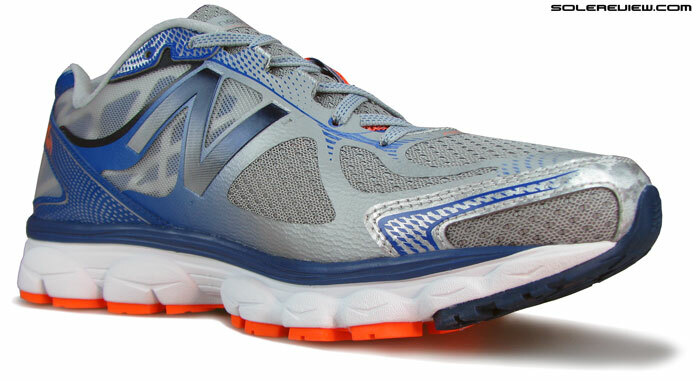 I’ve read the review of the NB Vazee Pace, but you don’t recommended it for long distance. Another choice?. Thank you so much. The Vazee Pace is very firm. Suggest something like the adidas Glide 8 Boost – the cushioning is just between the two shoes you’ve mentioned.